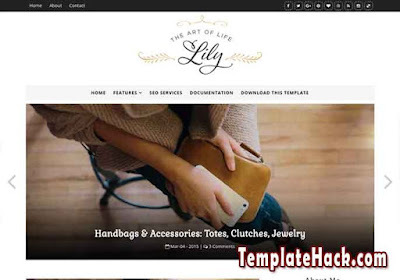 TemplateHack.com - Download Lily Fashion premium blogger template. Lily Fashion is fashion blogger template with high quality design. It is has minimalist and elegant design with slide show to show your latest post to get more view. Lily has elegant typography style with a unique font. This template is suitable for any fashion blog such as jewelry blog, dresses blog, make up blog, entertain blog, and travel blog. To get this free premium version of Lily Fashion, just click on download button and follow these link. Breadcrumbs, Drop Down Menu, Email Subscription Widget Ready, Featured Post, Girly, High CTR, Mobile Friendly, Page Navigation Menu, Photo Profile, Responsive, Search Box Button, SEO Friendly, Slideshow, Slider, Social Bookmark Ready, Stylish, Typograhpy, Elegant, Minimalist, Simple, 1 Right Sidebar, Black, Dark, White, 2 Columns, No Column Footer. Adapted From Wordpress blogger template, Beauty blogger template, Daily Blog blogger template, Fashion blogger template, Food blogger template, Gadget blogger template, Games blogger template, Gallery blogger template, Lifestyle blogger template, Magazine blogger template, OOTD blogger template, Photo blogger template, Reviews blogger template, Sports blogger template, Viral blogger template, Wallpaper blogger template.